Westworld is officially back as of tonight, and fans all over the world are gearing themselves up for the return of the hit HBO show. The cast and crew of the show have been on the promotional campaign over the last several weeks, which included a stop at Tribeca Film Festival for a panel about the series late last week. The panel went very smoothly, but slowly turned into a cringe-worthy moment when questions were opened up for fans in the audience. The Q&A session lasted only one question after a fan asked Westworld co-creator Jonathon Nolan to read one of his scripts. Unmoderated fan Q&As can be a little unpredictable, and the Westworld panel at the Tribeca Film Festival was proof of that fact. After a very informative panel, questions were opened up to the audience. The cast and crew of the hit HBO series were more than likely expecting some questions about Season 2 and spoilers, but that all changed really quick when the first person to ask a question began to stumble over his words. As he progressed, the audience let out a collective groan when the man asked Jonathon Nolan to read one of his scripts. That one question was all that it took to have the whole panel shut down. No further questions were asked and the cast and crew of Westworld left the stage. Jonathon Nolan and the cast took the question well, but nobody answered, and it was really, really awkward. Thankfully for the man who asked the question, it was very dark in the theater, so nobody can see him make an entire theater full of people groan. Westworld Season 2 starts up tonight and fans are more than excited. It's been over a year since the first season ended, making for a longer wait time than normal for a show to return. Series creators Jonathon Nolan and Lisa Joy revealed that they wanted to take their time crafting the second season to give fans the best that they could give. 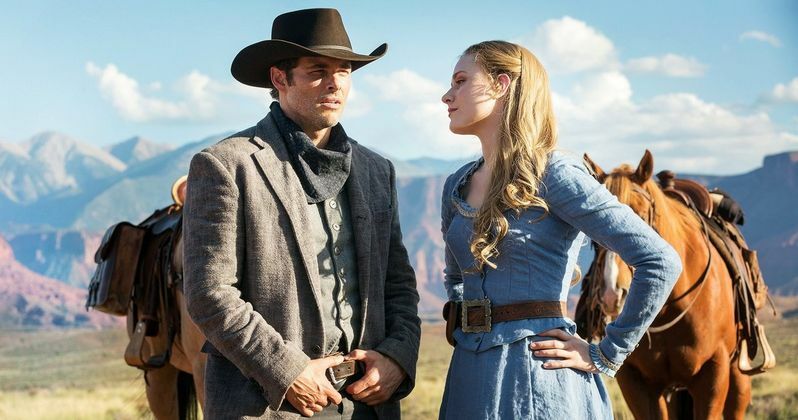 And so far, the reviews for the first handful of episodes have all been positive, which has sent the hype meter even higher for fans who have been theorizing about what will happen in the second season of Westworld. The new season of Westworld is set up to separate itself from the first season with new characters as well as old characters taking on new roles. Ed Harris recently revealed that his Man in Black character will be more of a good guy this time around instead of the antagonist that we all saw in season 1. As previously mentioned, Westworld Season 2 premieres tonight on HBO, but in the meantime, you can check out a very informative and spoiler-free panel with the cast and crew along with one of the most cringe-worthy Q&As in history below, thanks to the https://www.facebook.com/Tribeca/videos/10156345881579758/|Tribeca TV Facebook profile. The question comes in at about the 50-minute mark.